For some reason, I thought this blog needed a business card. You might think you need a mom card, or a personal card? Making a blog or mommy card can be an easy way to hand out your information quickly! Why did I “need” one? Frankly, because I really love cute things, especially cute things that match my current cute header. I mean, all those curly-Q’s, it’s just me! Anyway, making business cards is SO easy and fast, and the pay-back when you have an adorable piece of you is well worth it. I always design my own business cards in Photoshop. That is how I design almost everything here on this beautiful blog. Anyone remember when I was a photographer? Well, I learned Photoshop really well back then. And now here I am still using Photoshop, hardly picking up my camera. The circle of life, right? 1. Figure out what website you’re going to use to create your cards. I have used vistaprint. I actually made “mommy cards” before — where it hard a picture of my family and all our contact info to stuff in kids pockets as they head out the door to a playdate. Vistaprint does a great job printing high volume lesser-quality cards (in Vista print’s defense, I have never used any of their premium items, as the cost seemed prohibitive). I ended-up using Gotprint for this last order. I am really happy with How they turned out. I think I also used them for my photography business cards in 2007, and I always got a lot of compliments on that one. Nice card, good paper, good finish. 2. The website will most likely have a template you should use. For gotprint it is right here. Some of them just tell you the size you need to shoot for and let you do the margins yourself. Leave a lot of room for them to cut them. You don’t want any vital info cut off. Sure, it’s fine if the design is cut off a bit — but don’t let your phone # be sacrificed to the cutting room floor! Gotprint does have the margins laid out for you, so if you’re using another company, you might want to check GotPrint’s just to give you an idea. 3. Design it. I am not going to speak much for it. And you actually can find SO many cute templates out there on other websites, so don’t feel like just because you don’t know photoshop, you can’t have a perfectly lovely business card. Photoshop takes some time to learn, but it’s fairly intuitive. Google the things you want to learn, and then you’ll know! All the social media you can fit or want to fit. I just fit my main two that I use. Honestly, if they took the 3 seconds to type my name in, they’d see quick as a wink all my social media platforms. Right? 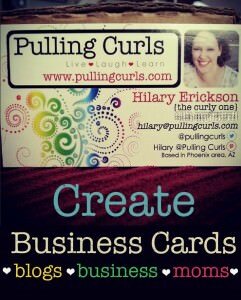 If you’re making a “Mommy Card” (Mom business card, Family card, or Mom Card) you’d want all your contact info. It’s more a “return if lost” card — or email me for a play date type thing. You’re just giving these to friends or potential friends. I used just a fixed template when I made my mommy cards. 4. Print it and hand it out. Honestly, no idea where I am going to hand them out, except when someone wins a contest. But, they’re awfully cute. Don’t you think? Have questions on how to make a blog or a mommy card? Ask them below — I’m happy to answer! Anyway, I hope this post is helpful to my readers. I know it’s not my normal genre. If you enjoyed this post be sure to check out my other blog income posts, or my blog income spreadsheet. You’ll see how far I came since January. 🙂 Also be sure to follow my “Business of Blogging” Pinterest board. Those are so cute! I keep meaning to make business cards… One day! They’re so cheap online, it sure makes it more possible!